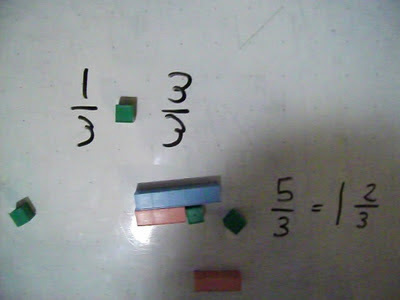 Used to be to get this info on teaching fractions using manipulatives you had to come to a seminar or training, usually held in Idaho...now I think the next one will be in LA or maybe Las Vegas...if we ever do one again. It's on my list but it could be a while. Nothing like in person training but it's costly and you have to travel and all that goes with it and blah, blah, blah. 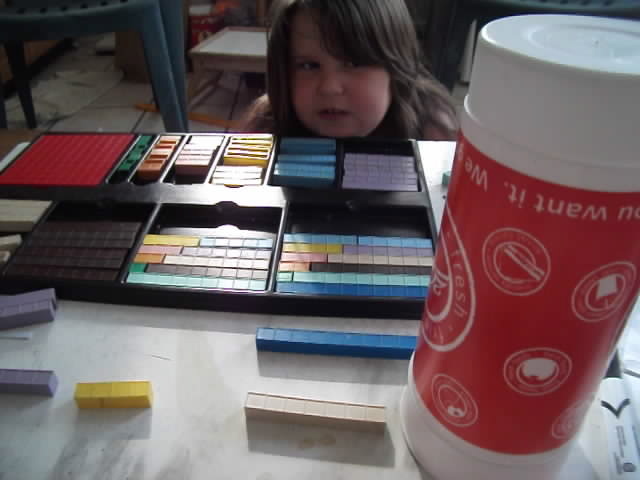 Much easier to just learn how to use base ten blocks by going the the house of math. Yes I know my fraction page needs serious work. 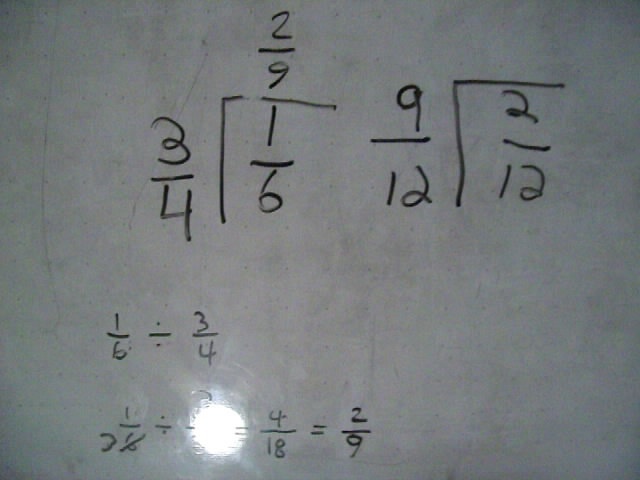 If you actually take some time to study the picture above you can see that the symbols are quite confusing to some students particularly to deaf students who couldn't for the life of them figure out the relationship between those numbers if they didn't understand division, or even if they did. How the heck does it turn into 2/9?!? Well, it doesn't turn into anything: we are counting. The rectangle we see has the one sixth in lowest terms instead of 6/36 which is what you get if you multiply 3/4 x 2/9...which is equal to 1/6...but getting there with symbols only and no concepts is impossible and modern math teaching doesn't even attempt to clear this up they just give you the rule INVERT AND MULTIPLY. And it's right about here many students make the fatal decision that math doesn't make any sense...I mean the rules changed for addition and subtraction, you can just add 1/2 and one 1/3 and get 2/5, it works for multiplication though, and then it's some crazy rule for division and they get bigger when you divide: this math is arbitrary crazy stuff. No. It's not. It is consistent and beautiful and simple. The five basic concepts are alive in well in our fractions games...knowing what one is, same, rectangles, the how many part the what kind part, and economy of symbol...but the problem with that last part is 95% to include the teachers don't understand what the short cut is doing. It's economy of symbol: fewest symbols possible, and it's a short cut and work saver. 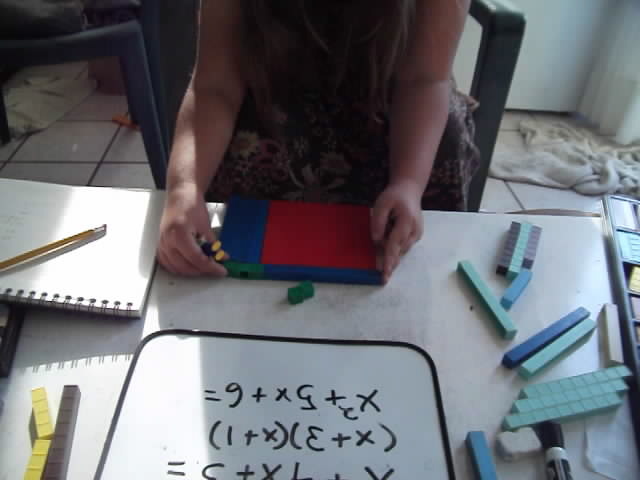 Now, if you want to see more with manipulatives to make it clear why we invert and multiply a 15 minute video on this (and a lot more vids) is on Sarah's page you need a password. Just get a month and I think you will see an annual pass is worth it because you won't get through everything I have up in a month and as the months go by I add more and more. I will be offering a special where you can apply your monthly to the annual if enough people get a monthly pass. One example with symbols only may not have been enough, a couple more examples with manipulatives should clear the whole thing up. The idea being if an autistic student can glean the concepts SO CAN YOU. Same when you see me using 5 and 6 year olds as students for algebra...if they can "get it" so can teen-agers. Passwords used to cost a buck. Now they cost 5 times as much...inflation and the fact that there's 10 times as much stuff on the password protected pages and then someone sending me a $24.99 vid that had basically 30 minutes on it, and not even a good 30 minutes just 4 math concepts poorly explained with lots of special effects and production. Here you get ZERO special effects and very, very low production value but very heavy on the information and concepts, well explained...or so I am told. AND HOURS AND HOURS ARE NOW UP. It's worth the 5 bucks. Here is a free page on addition and subtraction using manipulatives. But I digress. What we are doing is finding how many times one number is contained in another number. In order to do this we have to make them same or we can avoid all that work with the rule...basically we are just skipping a lot of steps and in the process skipping a lot of students who throw in the towel and change their belief to math is hard and arbitrary. 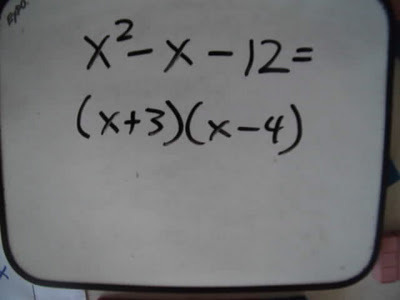 How do teachers teach students who already know they can't learn whatever math it is later on in high school? This will be discussed in depth with another little girl who got a convenient label put on her. She loves playing math but as soon as we bust out the school work, math is no longer fun and she knows it's hard even though we were just doing it with ease a minute before. That's how powerful beliefs and paradigms are. Her page is here. Both of these pages will grow over the coming months, and are especially good for home schoolers and teachers. Also now lots of Mortensen Math Materials available on my site, if you buy something there, a password used to be free. As of 20014 this is no longer the case. The fractions Page was going to go up in it's new form Monday but it's MLK day so I will have DBoyz and I doubt it will get done...although it is on the agenda for Wednesday...fractions from beginning to end. People on face book and twitter got the vid FREE for a day...it has since been taken down...joining us there has it's benefits. 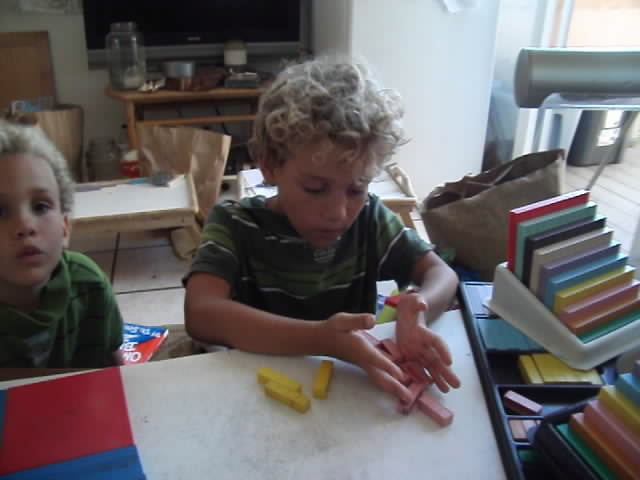 Learn how to use base ten blocks at my website. If this is you first exposure to Crewton Ramone's House Of Math, I highly recommend you go to the homepage and watch some introductory videos too, before you watch these because these are a little advanced. People think it's magic or the kids are geniuses (which they are going to be) and that they could never do this with their own kids or learn to teach math this way or whatever poppycock springs to mind when see 6 year olds doing algebra in their heads. Note for some of the problems we only SPOKE the symbols we didn't even write them down and he still solved the problems! This should put to rest the silly objection that they will have to take the blocks with them to school in order to do math. 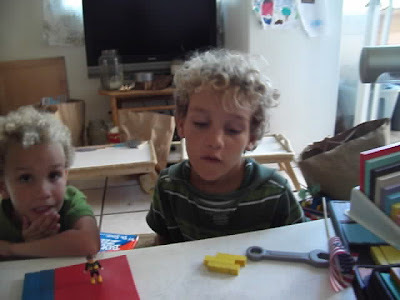 My boys sit patiently through the simplistic kindergarten math lessons they get at school and then pretty much ace whatever they are given as work or home work...or tests. They have some basic concepts mastered...and are working on mastering more concepts each day, which makes their math at school SUPER EASY. One of the concepts that was mastered early on is the concept of addends for ten. They both have instant recall for most of their addends but especially for 9 and 10. No pause, seven needs what to be ten? Three! INSTANTLY. This is extremely important and is a building block on the way to mastering addition, subtraction and multiplication and therefore division. Here we see the older boy who has not yet mastered multiplication working out another set of factors for 24...he knew 6x4 but didn't immediately know 8x3...but he will and this helped him to add that fact to his storehouse of math facts. They have yet to master their multiplication tables but we are getting there easily and gradually. 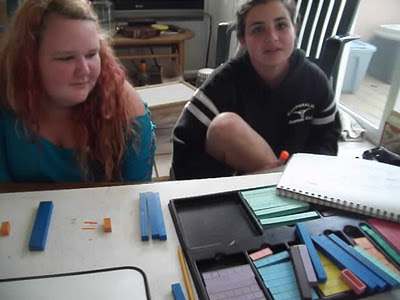 They both see that knowing how to multiply makes math easy and when it's easy, it's fun. In the vids you see here we stay positive. 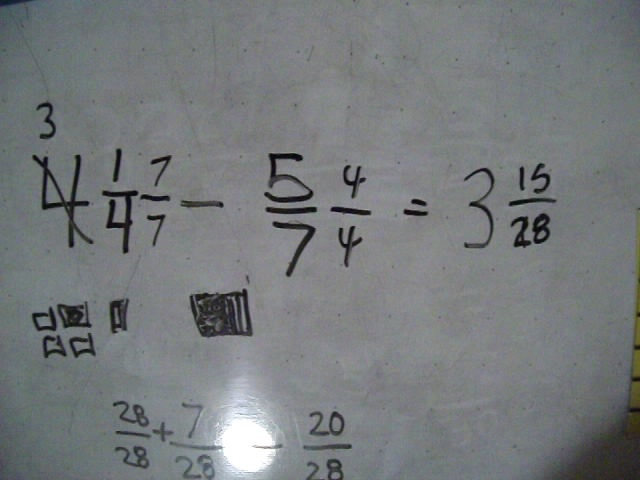 If you want to see them start learning to do problems like this with their friend hero zero you need a password. I have also created a page just for certain lessons with Dboyz and other students (like Emma and Sarah) that will be instructional to all. For those that have been following their progress this vid may be a little hard to follow due to the lack of symbols but you understand what's happening, for brand new people often times the take away is that's amazing but what are they doing? What they are doing is seeing pictures in their head. 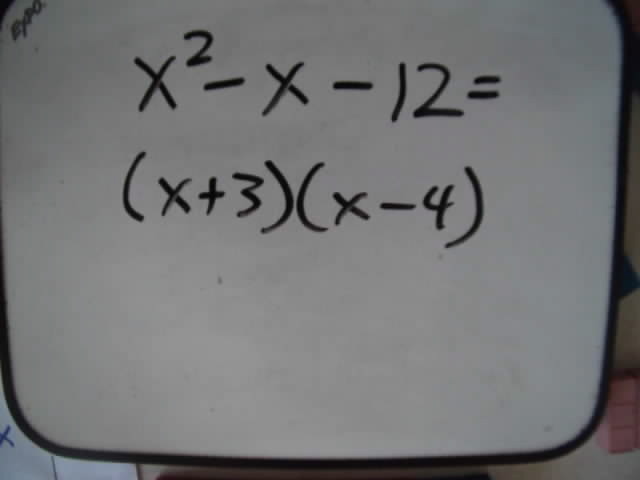 Here is the above vid plus a few more problems, listen to the 5 year old say, "we're so good at math it's easy!" Compare to some students I have that are sure math is HARD. 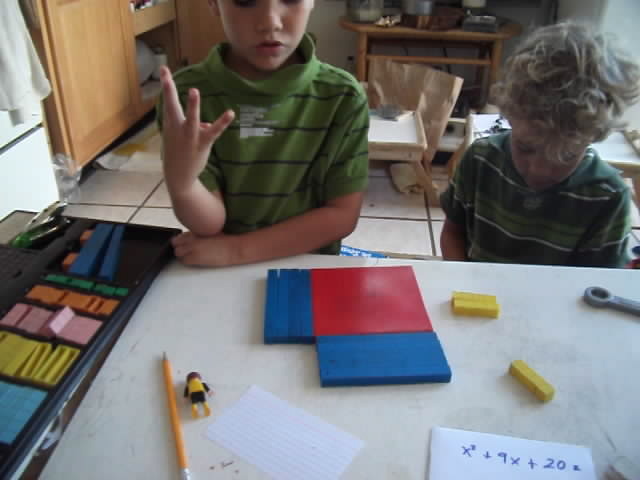 In which we answer the question do they have to carry their blocks with them to schoool. Now don't get the idea that I'm some kind of Math Wizard. Naturally, I am better at it than a novice (most of the time) but I have trained teachers all over the country to use this method, and I have trained trainers and have trained trainers to train trainers to train teachers...all of whom are still amazed at the results they get sometimes even after years of doing this. I have had teachers call me excitedly saying "it works!" Or "it never ceases to amaze me." Me either. Of course it works. You have the right tools for the right job. Now if you want to see all 26 minutes which is the above plus about another short 15 minute lesson on negative expressions where we use lots of the symbols you are used to go to the Dboyz page or find it on the sample lessons page. Password is changing and prices are going up. Dboyz page has the NEW password...those who want to renew (can you believe it's been a year) at the annual rate will get the old rate if you already have a password. You use the old password to get to the page to renew. Clever, huh? New Password has gone out. Look for it. If you don't get it contact me at gmail. Price is now $24.00. That's two bucks a month. One month which always works out to more than one month (ask anybody) is now $5.00...3 months for $10.00. Lifetime memberships are now available to those who already got a password. It's hours and hours of vids and pages and pages of PDF's, and more are added monthly all for $24.00 It will take you months to get through it all or weeks if you are diligent and spend hours each day. But for those who spend a few minutes a day and maybe an hour or two on weekends there is more there than you can shake your finger at. Don't get overwhelmed, just get started...watch the intro and then go to whatever topic you like. You may never see it all because I am always adding and might stay ahead of you at this point. That's okay you are always learning. Even old pro's enjoy watching the vids because they get something out of it each time. Crewton Ramone Playing Math With A 7 Year Old. Intro Lesson. Here is a good lesson for those with young children. This was a first time student who is being turned off to math at school. We had fun and she wants to come back for more. Look for this lesson on the sample lessons page too. You need a password to see the other hours (and hours) of lessons there but here is this one for FREE. Soon Emma will have her own page because she is an excellent case study. She has been labeled ADHD or ADD and is on her way to SPED and I'm sure part of that is due to her not "getting" math and other subjects the way they are teaching it...thus she get bored or frustrated and acts out. This is a 7 year old child. I have seen no indication that she can not learn or stay engaged for 1 hour at a time. But what do I know...? I am extremely biased against drugs for 7 year olds. I am also dubious when it comes to the ADD and ADHD diagnosis for bright little kids. Building Rectangles and Playing Algebra? No problem. She never figured out that most kids think algebra is harder than subtraction...which she informed me she doesn't like at all because "it's kinda hard and confusing." We will work on addends and clear all this up over the coming weeks. And you can watch the transformation at http://www.crewtonramoneshouseofmath.com/index.html. We didn't do any subtraction at all that she was aware of...but we will soon master that as well as quite a few other math concepts. BTW password is going to change soon and prices for passwords are going UP this year. Anyhow, here is a half hour of math...the hour went by in no time at all. Now available all manner of Mortensen Math Materials.